Oh Camden, how you refuse to grow up. While your Eastern cousins of Shoreditch and Old Street are getting shiny new chains and are kicking out the scruffy artists to Dalston, you remain the same. You’ve tried to change, giving your own market a facelift – but like all good rockers, while the face changes, the spirit remains the same. Deep down you’ll never change, never grow old gracefully. And, while you are still selling the same par of Doc Martins to the same rebellious teens, in your old age you’ve started to realise that sometimes you need the good things in life. Your market, once filled with Chinese food stalls selling food poisoning for £3 a bowl, is now starting to let in some nice venues. 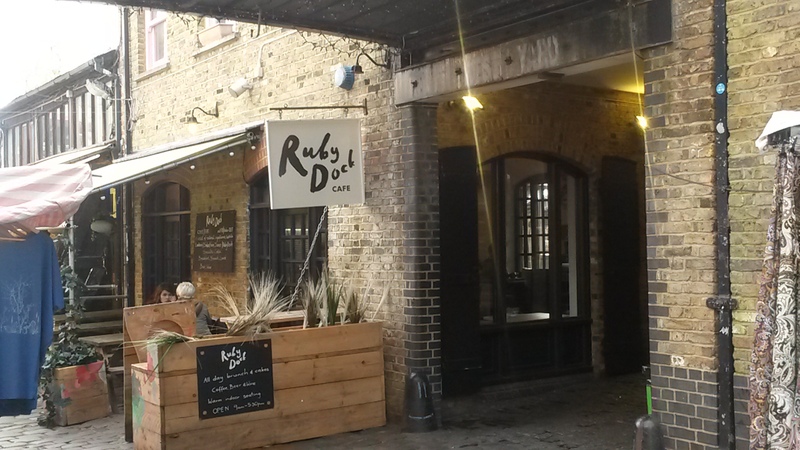 These include Ruby Dock Cafe. Hot stuff. Clearly no one gave Ruby Dock the memo about serving cappuccinos at 50 degrees as this is a hot cup of java. And it’s all the better for it. A decent sized serving, this was warm to the last. Using The Roasting Party beans, this is a tasty cup, with a velvety finish. At £2.60 it’s a steal considering its location slap bang in the middle of Camden Market. The chilled and clean inside, with its white walls and wooden benches, is a nice counterpoint to the craziness of the market outside. Its location is key with outside seating on both sides of the shop giving you perfect people watching spots no matter where you sit. My only concern is that come summer it’s going to get too busy and too chaotic and no amount of relaxing tunes can block out the chaos that is Camden. The usual stuff here. Baked goods and a breakfast menu. The stand out item on the menu was the homemade baked bean with ham hock and a fried egg. Apart from that, nothing hugely unusual or exciting. 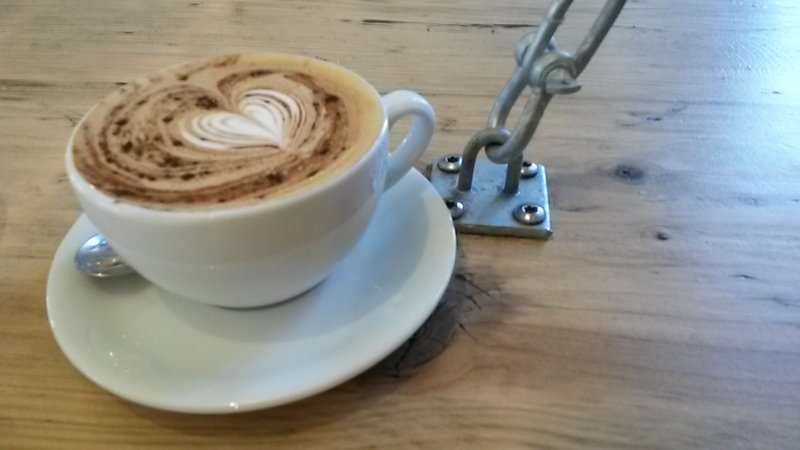 How people working in this market manage to stay cheery is beyond me but here at Ruby Dock they manage just that. With only two staff, they manage to be prompt and happy, keeping the place clutter free and everyone with a great cuppa. This is a fairly new café, having opened in July 2013, so maybe it just hasn’t had a chance to develop its extra-curricular activities yet. But as of my visit, there seemed to be no added extras. Which for somewhere is Camden Market is a shame. I know there’s a lot going on around and having somewhere that is just a café is a bit of a blessing but to offer no extras is a missed opportunity. It does get a point for having the market on its doorstep though. 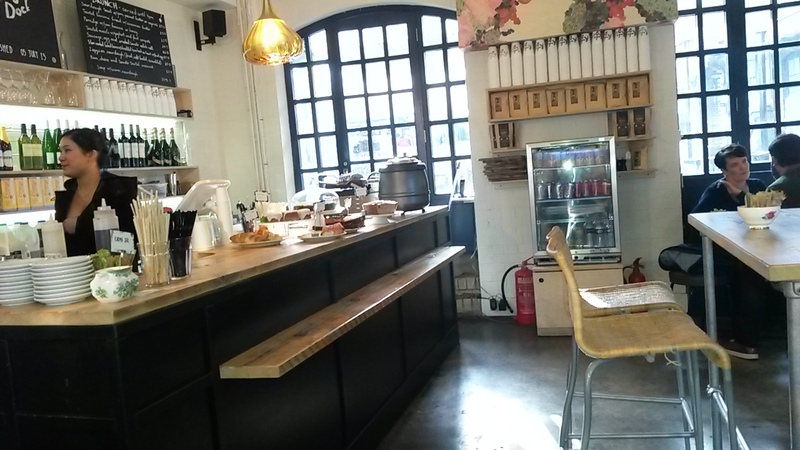 A peaceful haven in the market and a genuinely great coffee. I’ll definitely be coming back when it’s a bit more established to see how it has grown.